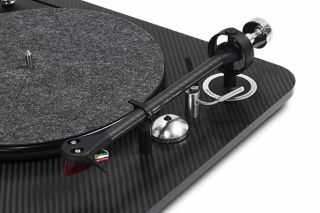 Elipson Omega 100 RIAA BT Carbon looks like Batman's turntable | What Hi-Fi? A new carbon-clad version of an already awesome turntable has launched at The Bristol Show, and we can't wait to take it for a spin. Omega has launched a new carbon-clad version of its 100 RIAA BT turntable, which looks like the kind of thing Batman might use to spin some tunes down in the Batcave. Called the Omega 100 RIAA BT Carbon, it's almost identical to its predecessor, but there are a few key differences. Most strikingly, the deck is made of carbon, giving it a cool new look. The lift arm is now made of aluminium, and it features an Ortofon 2M Red premium spec cartridge. Other than that, it's the same turntable, which is no bad thing at all. In our review last month, the 100 RIAA BT earned a respectable four out of five stars, and was described as a turntable that "manages to combine a respectable level of detail, solidity and an even balance with a dynamic and rhythmic understanding". Features including a phono stage, USB output and Bluetooth make it a thoroughly modern deck. A good thing too, as Batman wouldn't settle for anything less. The Omega 100 RIAA BT Carbon will go on sale next month, priced £700.